Sparty, our hearts are breaking. You lived 11 years, 10 years longer than any vet said you would. But to us, that’s still too short of time. Spartacus’ loss was sudden and unexpected. Knowing all his birth defects and medical challenges, you might wonder how it could be such a shock to us all? But, if you knew Sparty and how resilient he was, you’d definitely understand. He was the strongest cat in such a broken body. But that never stopped him. 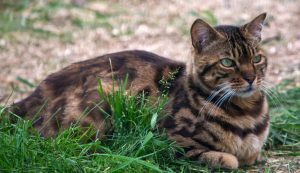 Spartacus came to TWS as a kitten. A donor had seen him for sale for a discounted price due to his birth defects and incontinence and asked if we could help. I contacted the seller and she agreed to place Spartacus with us at no charge. He was just like every other kitten – playful, full of life and friendly. But once we saw him move, we knew he was very different. He would drag his back legs and couldn’t control his bladder. Vet exams showed extreme and critical birth defects, including a deformed spine where vertebrae were on top of each other, compressing his spinal cord. The vertebrae were so frail that we were told, if he tried to climb or even fell once, he’d be paralyzed from the chest down and need to be put down. He also had deformities in his back legs and feet. Trying to keep Sparty down and off furniture, cat condos, etc. seemed like the biggest feat ever. He was determined. Cleaning up after Sparty’s leaking bladder and defecation was a labor of love. Eventually, summer came and we thought we’d try putting him in a bungalow. There, we could remove all climbing structures for his safety. He always had heated beds on the floor and friends to live with. When donors met Sparty, you could see their face drop the first few seconds. He didn’t move normally. He scooted instead of walked. But Sparty didn’t pity himself. And he would scoot over with his bold voice and win that person over. Then, he’d bounce himself up and trot away to play with a cat or grab a treat. Sparty was a much better runner than walker, even though he did it non-traditionally. 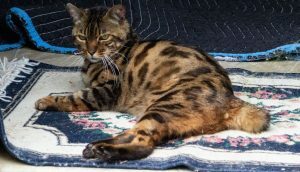 He lived with other special needs cats like blind Bengal Ciega, who left us last year. Both preferred to be called just special, because they were more resilient than any cat at TWS. Follow-up vet visits amazed vets. Spartacus’ spine had fused itself in a humplike position, which stabilized it. His tail was dying due to the compression, so we removed it for his comfort. He was incontinent and couldn’t fully express his bladder on his own. We assisted by simply giving him a hug around his belly. Spartacus was always vocal and eagerly wanted treats. He had days where he wanted love, and other days his favorite pastime was to chase other cats to be just like them. He was always happy and amazed us. From climbing on rocks and hammocks – something we’re told he could never and should never do – to being the biggest and one of the loudest loves around. It was such a shock to us all. Spartacus had received a lot of exams and always came out stronger. But I know he went the way he would’ve wanted to go – with his family, suddenly and boldly. He wouldn’t want to have slowed down and been sick for days or weeks. Sparty –You are free from your body now, and nothing can hold you back. You are an inspiration to us all. Eleven years with you was a privilege, my dear boy! This little boy arrived at TWS as a 12-week-old Bengal kitten with a walking disability. One of our supporters contacted us after seeing that the owner was looking for just the right forever home. We contacted the owner who had Spartacus’ mother and both of us agreed that the sanctuary would be a good place for him to grow up. He was born in 2008 and came to the sanctuary the same year to spend his life at his forever home. He is affectionately called Sparti by many of the caretakers. Due to a genetic spine deformity on his vertebrae, his back legs do not work properly. He can prop himself up on both legs, but cannot walk on them. He hops around the enclosure or he drags his back feet. He gets around very well in his non-traditional way and is the boss in his bungalow. He likes for his caretakers to come in and hang out in the enclosure with him, rubbing his head and talking to him.